This wonderful picture book for children and adults alike introduces the powerful practice of mindfulness in a fun and exciting way. With the delightful Monkey and his serene friend Happy Panda guiding readers to a calmer and more attentive mind, this whimsical yet warm presentation will delight all readers. As our story begins, Monkey is not so mindful - his Monkey Mind constantly jumping from one thing to another - but he encounters a mysterious and playful friend in Happy Panda. Panda helps Monkey recognize the simple joy of doing what you're doing while you're doing it. As an educator for over twenty-five years, Lauren Alderfer has taught all levels-from graduate studies at SIT Graduate Institute in the USA, down to the first grade in US-based overseas schools. After living in India for over a decade, Lauren now divides her time between India and the Americas. Her ability to blend a Western perspective with the deep spirituality of the East invites educators to cultivate their inner lives in the daily act of teaching while developing mindfulness and compassion. 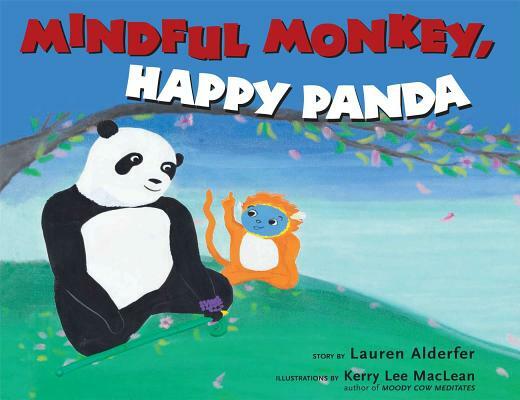 "Mindful Monkey, Happy Panda is designed to teach young readers the value of mindfulness. Although mindfulness is a practice especially advocated by Buddhism, Mindful Monkey, Happy Panda is intended for children of any religious faith or background, as it describes the idea in simple and secular terms. The bright, friendly illustrations bring this invaluable parable to vivid life. Highly recommended." "This beautiful story shows us all how to dwell peacefully and happily in the present moment."